myoldmac.net - Magnavox Odyssey 2100 · Pong console released in 1978 - Buy it! 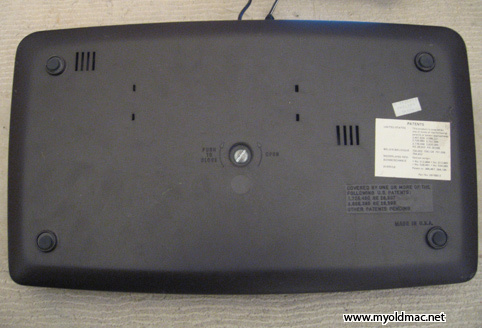 Here you can buy an original Magnavox Odyssey 2100. The case is in used condition and one of the paddles seems to be decalibrated - the block does not come up to the screen. Maybe someone can repair it, for the display it is a nice item. It is sold withou any guarantee. Please see the Photos. The Odyssey 2100 was released in 1978. It is an improved version of the 2001 which used the National Semiconductor MM-57186N chip. It plays six different types of games, each type having several variations, making a total of 23 games. 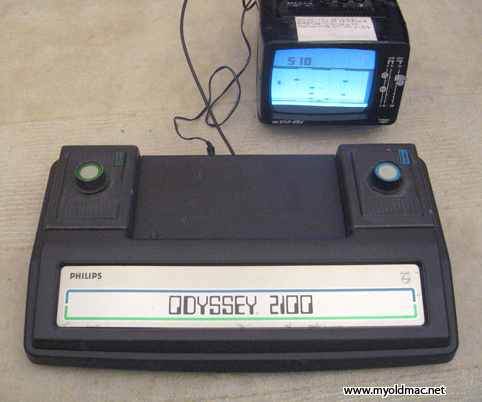 Odyssey 2100 games and reset functions operate exactly like the 2001. 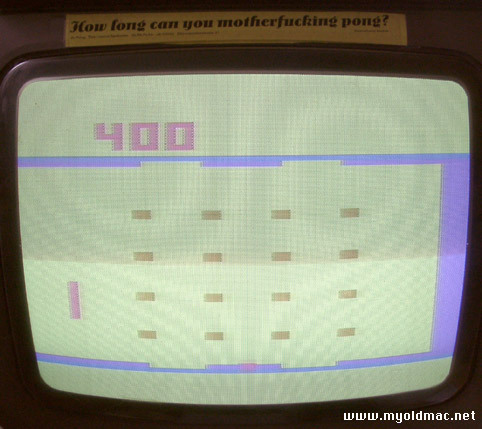 Its closest US equivalent is the unreleased Magnavox Odyssey 5000, which played 24 games for up to four players. Games included Tank Battle and Helicopter, which Odyssey 2100 did not feature because of its different game chip. The National Semiconductor MM-57186-N chipset can play 6 different colour games with variations, resulting in a total of 23 available games. The six games are Football (soccer), Ice Hockey, Tennis, Handball, Wipe-Out and Pinball. Wipe-out (7 variations) is a breakout game where you have to destroy all the squares on the screen. Flipper (7 variations) is a kind of pinball game where the ball bumps onto little squares spread on the screen. It looks more like a typical pong game than a real pinball game. The other games (Tennis, Handball, Hockey, Football) have 2 variations each. Most games are for two players. There are absolutely no button or switch on this system, all settings are made with the two buttons on the controllers. One button is used to cycle through games while the other one resets the game. These paddles are very similar to those of the later Odyssey²/Videopac systems, except that they have knobs instead of sticks. Hier können Sie eine original Magnavox Odyssey 2100 Videokonsole kaufen. Sie wurde gegen 1978 in den U.S.A. hergestellt und ist eine von Sammlern sehr begehrte Konsole. Der optische Zustand ist gut, leider ist aber ein Paddle dejustiert, der Balken kommt nicht auf den Screen. Eventuell kann man das jedoch reparieren, als Glasvitrienen Ausstellungsstück ist es ideal. 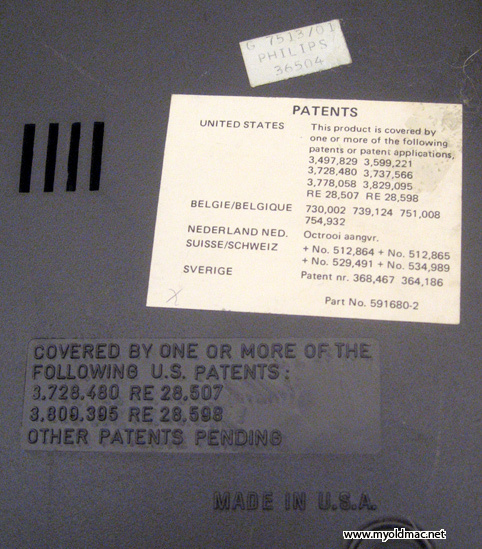 Magnafox Odyssey 2100 console patents, made in U.S.A.